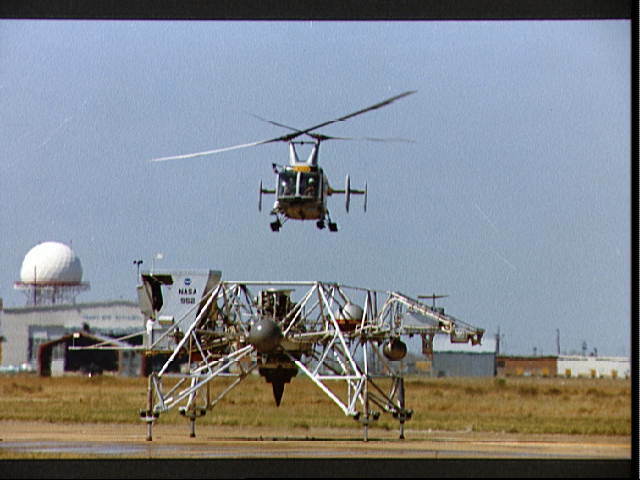 A Lunar Landing Training Vehicle (LLTV), piloted by Astronaut James A. Lovell Jr., sets down on the runway at the conclusion of a test flight at Ellington Air Force Base. A hovering helicopter watches the LLTV landing. Lovell used the LLTV to practice lunar landing techniques in preparation for his scheduled mission.